Afterward, Paul said in a statement that he hoped the verdict would send a "clear message that violence is not the answer  anytime, anywhere." Boucher's attorney, Matt Baker, said they would appeal. The trial included testimony from doctors as well as other neighbors, but the most riveting testimony came from Paul and Boucher. 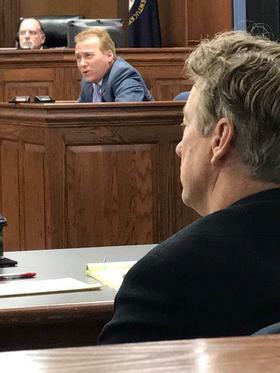 Paul, a former GOP presidential candidate, told the jury Monday that immediately after the attack, "the thought crossed my mind that I may never get up from this lawn again." In his lawsuit, Paul sought up to $500,000 in compensatory damages and up to $1 million in punitive damages. Baker had conceded a "reasonable award" might be in order for Paul's pain and suffering but said no punitive damages should be awarded. Baker said that Paul had resumed his "customary lifestyle" that includes golf and a skiing vacation. Boucher has already served a 30-day prison sentence after pleading guilty to assaulting a member of Congress. Federal prosecutors have appealed, saying 21 months would have been appropriate. Boucher also was fined $10,000 and served 100 hours of community service in the criminal case. Paul testified that he got off his riding mower to pick up a stick and was straightening up when Boucher hit him with such force that both flew through the air 5 or 10 feet (1.5 to 3 meters). For a moment, Paul said, he had a flashback to the 2017 shooting at a baseball field when members of Congress were practicing for a game. Rep. Steve Scalise of Louisiana suffered serious injuries in the shooting. Boucher told the jury that he attacked Paul after watching the senator start forming a brush pile near their property line. And let me guess Boucher has homeowners insurance that will cover this so he doesn't give a schitt about the verdict. Don't believe that any homeowners insurance will protect Boofer from being an idiot. The judgment is against a the person, not the home? Rand's wife Kelley now has personal homeowners insurance, a handgun! I thought Rene was a girl's name; anyhow, this imbecile belongs in a psych ward.